From upgrades, repairs, calibration services, and engineering needs to brand new designs or enhancements, the staff of Emerson Apparatus can help you. We invite you to put our trained and experienced technicians to the test. The reliability of your testing results often depends on how well your instruments are calibrated, especially older units in need of repair or units that have been moved or are in environments susceptible to variable conditions. When testing equipment goes uncalibrated—even by the slightest of margins—the reliability of results becomes questionable at best, as well as their repeatability. Your people get frustrated, customers become dissatisfied, and your business reputation (and quite likely your margin) suffers. The technicians at Emerson Apparatus are trained on a wide range of testing instruments. They can help you calibrate and/or repair and adjust various testing instruments, from compression testers and speed dryers, to sample cutters, test fixtures, thermostatic controls, software applications, and more. Often, this can be done via telephone consult (with our trained staff guiding your personnel through the calibration process) or on-site at our facilities or yours. When you can’t find what you need—whether it’s a large piece of testing equipment, a sample cutter, test fixture, or benchtop model—we invite you to put our engineering and design staff to the test. We recognize that not all testing needs can be addressed with an “off-the-shelf” product. Emerson Apparatus engineers are experts at working with customers to design custom engineering solutions specific to their needs. In fact, we’ve been developing custom solutions for more than 100 years and our record of success for producing high quality, cutting edge, precise, and user-friendly testing equipment that routinely exceeds industry standards is unsurpassed. Testing solutions adapted and customized specific to your needs often translate into lower production costs, improved product quality, and increased customer satisfaction for your company. Emerson products are designed and manufactured to ASTM, ISTA, TAPPI, and other applicable industry standards. When you are ready to advance your production, Emerson Apparatus is ready to help. Take advantage of our engineering team’s vast experience in new equipment design as well as retrofit engineering. New production equipment designed and built to your specifications. Retrofit existing production equipment including servo systems, computer controls, latest materials, technologies, etc. In-house fabrication, welding, machining, assembly, and testing ensures your equipment is debugged before leaving our facility. On-site rigging and training ensures your equipment is in place and running quickly. Custom solutions to integrate your disparate production systems. Our engineering team stands ready to assist you with your various engineering needs. Contact us today and begin your journey to the next level. – Or any other engineering need. If you have a specific testing or sample size requirement, Emerson Apparatus can customize any of its Compression Testers (from Model 2210 to Model 8510) to meet your platen size and platen opening requirements, as well as custom software and testing needs. 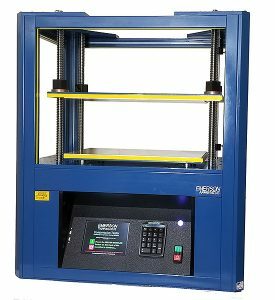 For example, in this modified 2210 compression tester (see picture), Emerson Apparatus designed and manufactured a 2,000-pound tester with a 13″ wide x 20″ deep x 16″ platen. It has all the capabilities of our standard Model 2210, but with a larger test area. Emerson Apparatus engineers are experts at working with customers to design custom solutions for you. Contact us today to discuss your specific needs. When your testing needs change or the quality and consistency of your results begin to decline, sometimes all that’s needed is a “re-boot” of an existing piece of testing equipment. Emerson Apparatus technicians are specialists at upgrading and repairing virtually any piece of testing equipment. Our upgrade and repair packages offer items such as all new electronics, state-of-the-art software enhancements, program recovery, and much more depending on the type of equipment. All of our upgrade and repair packages include . . .
Emerson upgrades are designed and manufactured to ASTM, ISTA, TAPPI, and other applicable industry standards.